Probably our best known vehicle, this Travelling Post Office Sorting carriage is currently the only one in the UK fitted with working mail exchange equipment.Operated on the Great Central during several gala events each year the spectacle a non stop mail exchange provides is one of the most impressive in railway preservation.Built at York in 1937, and originally numbered 2441, it would have been outshopped in the full varnished teak style the LNER used at the time. 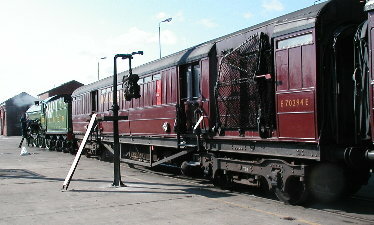 Entering service in ran on the East Coast Main Line, providing mail sorting facilities on the many TPO services that once operated on this route. Renumbered 70294 in 1943, it continued in BR service (repainted maroon, and latterly rail blue) until 1971, by which time it had been transferred to the East Anglian main line. With the availability of exchange equipment on 80301 (see seperate page) it was then decided not to use 70294E for such demonstrations in view of its rather frail bodywork. It does however remain serviceable and often appears at GCR special events open for display. We hope to fully restore it at some point in the future.